“We have developed a totally new, very advanced and fully-integrated media measurement dashboard with dozens of new metrics for news and social media and a very easy to use interface,” said Glean.info CEO Doug Chapin. The company changed its brand name to Glean.info because the term “cyber” has become associated with computer hacking. “The new Glean.info brand reflects the company’s enhanced media monitoring capabilities, high-quality data, superior analytics, and, most importantly, its unmatched ability to deliver in-depth media intelligence for PR, marketing, corporate communications, and competitive intelligence,” Chapin stated. Founded almost 20 years ago by PR veteran William J. Comcowich, CyberAlert was one of the first media monitoring companies to focus on collecting media mentions from online sources. It has served the media analytics needs of thousands of companies, not-for-profit and government organizations, and PR and marketing agencies. According to measurement expert Katie Paine, CEO of Paine Publishing, Glean.info’s new interface takes functionality to a whole new level, “To say that Glean.info is the new version of CyberAlert is the equivalent of saying that a Fitbit is just an upgraded watch,” Paine writes in The Media Measurement blog. 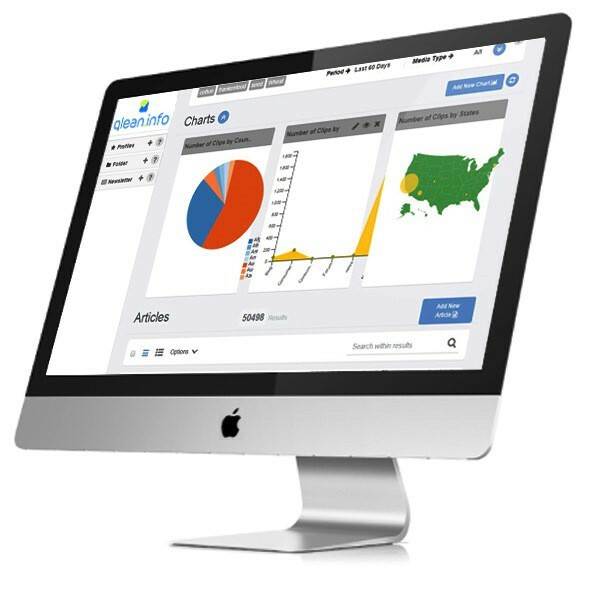 By integrating all news, social media and owned media, the new Glean.info dashboard can offer new metrics and advanced analytics that deliver unmatched insights on the full range of corporate communications. Glean.info offers a 14-day media monitoring free trial and an in-depth demo of its new media measurement dashboard. The rebranded Glean.info offers customized media analytics solutions and a full range of monitoring services across all types of traditional and social media. Its standard service packages include a fully automated media analytics service without human analysis at lower cost. It also offers analytics programs that combine its advanced software with human analysis to deliver the most accurate analytics and useful insights possible. “Our well-trained and very experienced analysts are among our greatest strengths,” Chapin said. “They are able to assess clips with greater depth and accuracy than any of today’s software can and they offer clients more meaningful insights on the impact of their PR and marketing programs.” The human analysts assess news and social media mentions for sentiment, messages, prominence, dominance and other qualitative factors requested by clients. They also evaluate social media content to identify emerging issues or areas where the client’s products and services outshine competitors. The new dashboard and all Glean.info services are fully customizable for each client. Large global organizations with multiple lines of business can easily create dashboards for specific brands, divisions, and geographies. Public relations professionals monitoring a crisis or a campaign can create specific views, filters, and dashboards. Glean.info will also create new custom metrics for clients. One of the dashboard’s main benefits is its ability to provide a single overview of how earned media or social campaigns are impacting key business objectives, Paine says. “Best of all, Glean.info is still a bargain compared to other integrated dashboard systems,” Paine adds. “Depending on how many data sources you need to monitor, how complex your dashboard needs to be, and whether you need human coding or not, you can start gleaning info for under $1,000 a month.” Starting price for news and social media monitoring without human analysis is under $500 per month. Comprehensive monitoring of online news, print news, U.S. TV and radio news, and worldwide social media. The online news component monitors 65,000+ news sources worldwide in 191 countries in over 300 languages including Chinese, Japanese, Arabic, Russian and Korean. The system also monitors over 90 million blogs. The standard social media monitoring package tracks Facebook, Twitter and LinkedIn. The system can monitor any other social media network requested by the client including Pinterest, Instagram and Snapchat at additional charge. Advanced keyword search features to ensure the most accurate search results that virtually eliminate irrelevant or extraneous media items. Personalized, automated alerts of media mentions that are designed and formatted around the graphic standards of each client. Executive news brief that condenses hundreds of news clips into a concise 5 to 10-minute “read” focused exclusively on relevant news that impacts your company. A redesigned filtering system to segment media mentions in most any way the client chooses. A universal search function that enables clients to search a two-year media archive with any key words or phrases and receive immediate search results within the dashboard. Ability to integrate owned website data and other marketing data into dashboard results. Superb customer service from knowledgeable, well-trained and respectful analysts. Service agreements that do not bind clients to yearly commitments. Glean.info provides comprehensive monitoring services across all types of traditional and social media and customized media measurement & analytics solutions. Glean.info monitors online news, print news, TV and radio news, and social media. Its new communications measurement service integrates data from all media into a single online dashboard with dozens of new communications metrics. Originally published at glean.info on December 6, 2016.